Movie 7 English. Ancient. Grey is most likely a misspelling of grea, short for great. It also may come from grey, meaning old or ancient. If the opponent's attack is 600 or more at the beginning of the battle, discard one card from your hand whose type has the word Dragon in it and take this card from your hand and place it in the Digimon Box. One of the 10 Warriors. This firey Ancient Dragon changes the breath of the earth into a cataclysm! This Digimon can use Dragon Breath. When you use it, change the part that says "your entire hand" to read "3 Digimon cards from your hand" and the part that says "less than 400" to read "more than 400"
Metal Greymon (Blue Frame) + Win Ratio 80%! 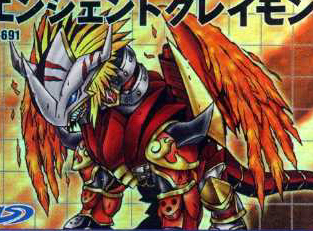 Notes: Ancient Greymon was one of the Warrior Ten. He was reincarnated into the Spirits of Fire, H and B.